I mentioned previously that between the change in our church meeting schedule, sick kids, and substituting, I have yet to make it to Sunday School this year. Well, Andrew has yet to make it to a priesthood meeting. 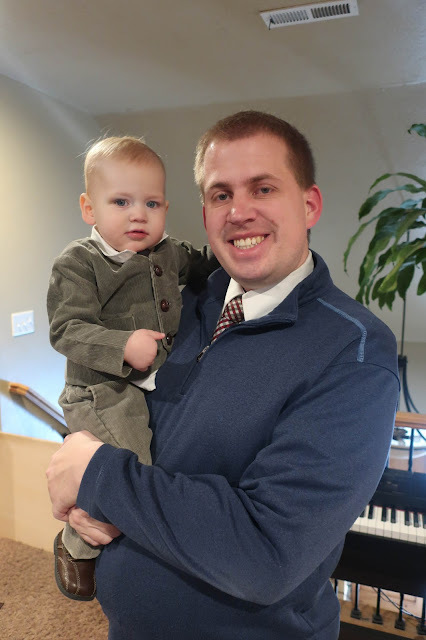 He wandered the halls with a fussy Alexander when I taught Relief Society three weeks ago and last week he came home with Alexander (because it was his turn to be croupy and I had taken Zoë home from church early the week before since she was too sick to attend her class). 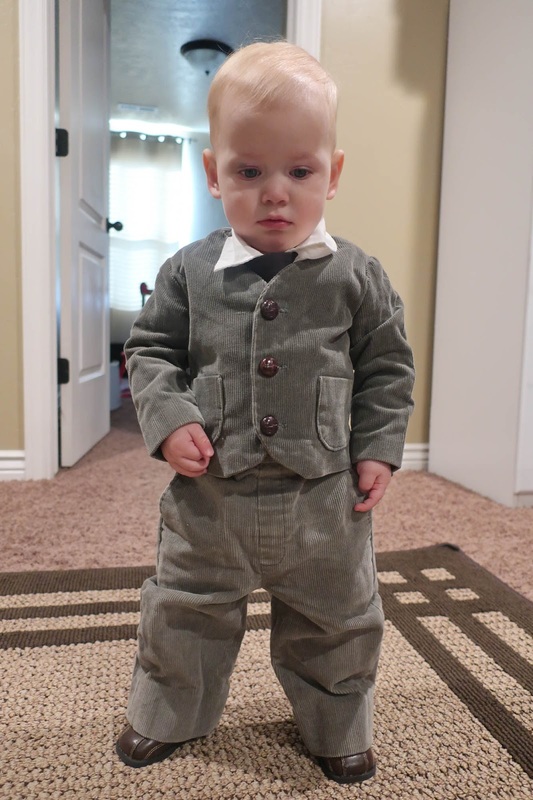 We still dressed up Alexander in his Sunday best and took him to sacrament meeting, though. 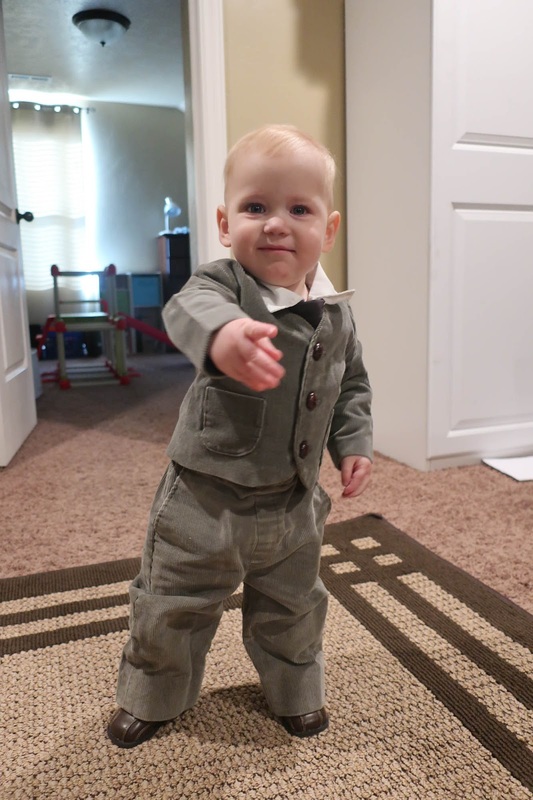 We decided to try on Daddy's old suit (Aunt Susan made it). It was still a little big for him, but he looked super cute (if not a little sick/stunned)! It's a good thing he got to wear it last week because he won't be wearing it for several weeks (at least not the jacket). The poor boy was so sick and exhausted from even just one hour of church that he actually fell asleep for Andrew at home—without any milk at all (he still insists on nursing before going to sleep)). I'm not sure that has ever happened. That evening we left Alexander home to hang out with (and infect) Grandpa because we had dinner scheduled with our friends from our very first neighbourhood. We originally had plans to get together with them on November 11, but Tamsin so nicely messaged me and told us that we could certainly reschedule the dinner for a later time (or still come if we wanted to); we decided to reschedule since we needed to have some family time. Tamsin is another friend who has been such an angel through this whole process of losing Andrew's mom. I am learning so much about mourning with those who mourn from our dear friends who are reaching out to us in so many beautiful ways. Tamsin lost her father a handful of years ago and more recently her family suffered the heart-wrentching loss of their newborn baby, Piran. She has flooded my inbox with words of wisdom and encouragement and kindness. Our kids weren't nearly as excited for this dinner party as we were, which is perfectly fair because for all intents and purposes they were going to dine with complete strangers. To get them excited, I was telling them a bit more about Tamsin's kids and when I was introducing her eldest, I said, "Plus, he's kind of nerdy from what I can tell, so you can talk to him about Greek mythology and Norse mythology and he'll be right up to speed." The kids became, as Tamsin had predicted and as Benjamin put it, "fast friends." So I was telling Tamsin about how I'd described her son and she smiled sweetly and said, "I thought they'd get along. I told him something similar—I said that your kids were clever and witty and..."
And I thought to myself, "Oh, dip! Tamsin is so kind and eloquent! She uses words like 'clever' and 'witty' and I use words like 'nerdy,'" which to be fair is a huge compliment in our house! My second example of ineloquence is when I observed her sweet baby sitting calmly in his high chair and I said, "Wow! He's so happy! My babies are not so good-nurtured." And then I was like, "Wait...I mean..."
"Ooh! Self-burn!" Andrew said, because he, too, is sometimes hopelessly ineloquent. Obviously I meant natured. My babies don't sit quietly in their high chairs. Ever. 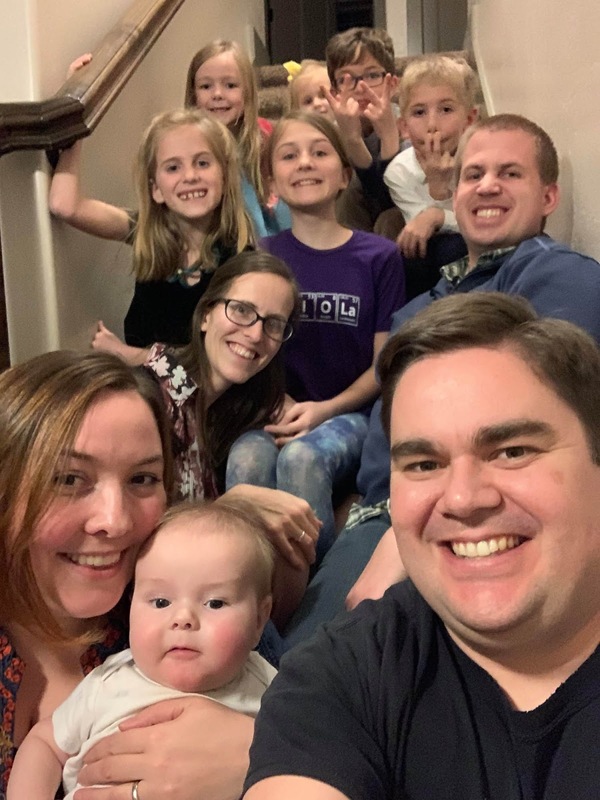 We had a wonderful evening with Tamsin's family and our children have been asking about playing with her kids again so we'll have to get together again before we move! I'm so thankful for friends who put up with all the moving our family does and make an effort to stay friends with us anyway. Tamsin and I have known each other since we were both sweet little newlyweds and though we were only in the same ward for a year our friendship has blossomed over the internet, which I think is a pretty great thing. Sometimes—you know, with moving every couple of years—I don't know what I would do without the stability of my long-term, real-life-and-internet friends. I'm always so happy when we can meet up in real life, of course, but I so appreciate the effort it takes to keep up with each other long-distance. Tamsin is very skilled in this department. Though you only count seven kids in this picture, we have nine kids between us now! It made for a wild, wonderful evening! "Blessed are those who mourn, for they shall be comforted" -- Matthew 5:4. I don't know why some days are harder than others. Today the loss of both Karen and Burt is hitting hard. Feeling for their siblings and spouses and children, who I am sure are mourning much more deeply than I am. Tamsin is a good friend to you. I think of her often because of her bed! Which is in Patrick's room.